Become a "Flying Ace" yourself! 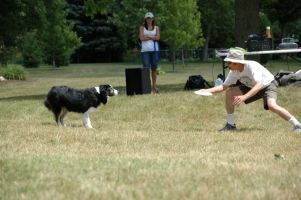 Lessons are held at Carr Park in Manchester, MI or at your location. Rates are $25 per half–hour session, plus gas for locations over 50 miles. The Flying Aces offer private lessons and consulting for anybody wanting to become an expert at Frisbee or hacky sack skills and activities. Lessons are available for individuals, physical education instructors, parks & recreation departments, libraries, scouts, or any other interested organization.